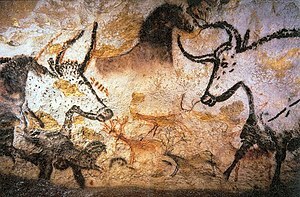 Cave painting of the Paleolithic. Prehistory means "before recorded history". History is a way of recording what happened in the past. In ancient times, people used to remember stories by repetition or turning them into songs. Then came cave painting. Finally, about 6000 years ago people started to make marks on clay tablets to help them remember, and so writing was invented. Songs and sagas are likely to be changed as they are learned by each new generation of minstrels and story-tellers. Painting and art usually only captures a moment in time. Writing really only emerged about 5000 years ago, in what we call The Bronze Age. That is why Historians (people who study history) don't know very much about what prehistoric people did. The information we have about prehistoric people is mainly gathered from archeology - the art of finding and interpreting things that are buried in the ground. Sometimes we find ancient burial sites, which contain human remains and sometimes 'grave goods' which we can now date fairly accurately by measuring the decay of an isotope called Carbon 14. Other such artifacts include weapons, jewellery, pottery, painting, even preserved post-holes and earth-works that allow us imagine how their buildings may looked and how they used to live. Human activity really started when people picked up sticks and stones, bound them together, and made themselves simple hammers, spears and other tools. It seems that, because making and using tools is difficult to learn, language evolved to compliment simple grunts and gestures. According to ancient writings (scripture) mankind suddenly appeared fully human. According to the theories of Darwin, we seem to evolved alongside forest primates (monkeys and apes) that lived in Central Africa. Exactly why our ancestors abandoned their ancestral homes and started to migrate all across the world is not clear, but there is archaeological evidence to suggest that a huge wave of primitive people did just that about 70,000 years ago. Reconstitution of a Neanderthal people. People had started to make stone implements long before this first great migration. Now they moved around the land hunting animals and gathering plants, and so are sometimes called hunter-gatherer people. Probably they mostly ate the remains of dead animals killed by other predators.They seem to have started living in caves for shelter in the winter and developed a nomadic lifestyle, living in tents and following the herds of wild animals that they hunted. We have traces of their movements through bits of specially sharpened flint from spears, stone axes and even sometimes (although it is rare) animal bones and ash from ancient meals and seeds from things that they ate. By looking carefully at the soil around these buried artifacts we can guess the period when they were discarded and weather in those days. Meat was very important because it is nutritionally much richer than food derived from vegetation, and probably eating fish and animals allowed our ancestors to spend less time hunting and gathering and more time developing language, clothes and other things which made their lives much better. During this period people start to construct small tents to sleep in, and have learned how to control fire. We think they may have invented the bow and arrow by this time. More advanced tools are found, showing that people of this period were getting cleverer. By this time, humans are hunting and killing animals, instead of scavenging. This is unusual behaviour for primate creatures such as we are, and meat may have been the "forbidden fruit" of ancient legends.The remains of baked clay pots are sometimes found but they are rare, probably because these people were still moving around a lot, pots are rather fragile and not really essential to their survival. During this period, people have become much cleverer. In the Levant (which Europeans call "The Middle East"), people started to herd animals and grow plants in special places that became farms. Now needing to travel less and stay longer near their cultivation, they started to and build more durable homes of wood and clay. Soon the first wooden villages, clay towns and later, stone cities appeared. However, in less climatically favoured places like Northern Europe, people did not start create farms or cities for a long time. They did however mark sacred places and build stone burial chambers called "barrows" and leave with the dead grave goods perhaps intended to help them survive during their 'after-life'. The Ancients also created monumental temples that were sometimes filled with expensive sacrificial artifacts that may have had religious significance. Reconstruction of a neolithic house in Germany. These archaeological remains have been mostly quite well preserved and can still be seen today. A prime example is Stonehenge in Britain, which started as a wooden structure around 10,000 years ago, and was rebuilt in stone about 5,000 years later. Much of Stonehenge still stands today. There are many other such sites all around the world. All over the world, people developed their own cultures which eventually grew into the great civilizations that this book is about. Many prehistoric habits and customs became significant features of the later civilization. The cradle of civilization seems to have been inland from the eastern coast of the Mediterranean, an area generally known as The Levant. It stretches approximately from Egypt in the south to Syria in the north and Persia in the East. Groups of people lived in different parts of the Levant, each with their own culture. This is known as the Pre-Dynastic Period, a part of the Old Stone Age. Historians say that as the desert got hotter, forcing people to move northwards towards the rivers Nile and Jordan and onwards to the fertile crescent between the rivers Euphrates Tigris (Mesopotamia -approximately modern day Iraq and Iran). People now ate more fish that previously. Seafood, which is rich in the chemicals needed to develop brains seems to have played an important role in Human history. During this early or pre-dynastic period, we mainly find stone axes and other small tools. We know that the Egyptians began mining a stone called "chert", because the remains of a mine was discovered that seems to be about 35,000 years old! Chert is a rock that can be chipped to make sharp stone tools for stabbing and cutting. Unfortunately, we do not have other much evidence about this early period of Egyptian history, probably because the rivers and streams have washed it away. Archaeologists have found some prehistoric hunting camps, mainly in what is now desert. As time went by, people started farming and making pots, and we have a lot more evidence because of the things they left behind. We have found bracelets, beads, hairpins, arrows, pots and even skeletons. Gradually, powerful hunters gathered together sizeable tribes, because that made life easier and more survivable. Tribes sometimes traded and sometimes fought each other for scarce resources. Rules had to be made and enforced, so rulers and soldiers developed the earlier skills of hunters and warriors in order to enforce laws. Almost full skeleton of Lucy, an Australopithecus. 2.5 million years ago – Start of Lower Paleolithic age, during which a type of early pre-human called Australopithecus lived. These people made tools out of bones and stones and made shelters out of branches. 100,000 years ago – Middle Paleolithic age. Neanderthal people and Homo sapiens lived in the same time. People sometimes live in caves. They begin to bury dead people. 40,000 years ago – Upper Paleolithic age. Cro-Magnon people (Homo sapiens) lived. People make spears from antlers. People make houses from hides (animal skins). People paint cave painting and make things out of clay. People make needles out of antlers. People make jewellery. 10,000 BCE – 4, 000 BCE – Mesolithic age. In North-west Europe people make bows and arrows. People use dogs to hunt and to carry things. 9,000 BCE – Neolithic age. People in the Near East start to change from hunting and gathering food to growing crops and using farm animals. 7,000 BCE – People in South-west Europe begin using copper to make tools. 2,580 BCE – The Egyptians build the great Pyramid of Cheops in Giza. People in the Middle East use iron and make plows. 2,400 BCE – People make Stonehenge in England. 3,300 BCE – 1, 200 BCE – Bronze Age in Britain. People make tools out of bronze. This page was last edited on 15 December 2014, at 22:23.